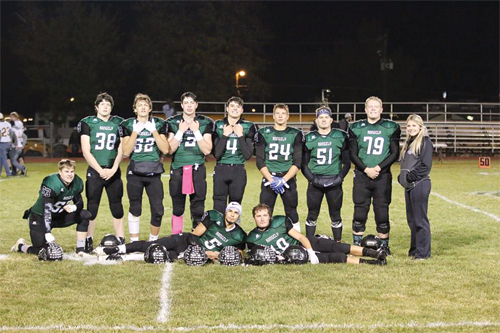 Senior members of the 2018 Rangely Panthers football team. RANGELY | A coach can make or break a team. Most often, a team’s fortune depend on the whims of one man—the coach. There have been many great coaches who have steered their teams into history. Football legend Vince Lombardi once said, “The greatest accomplishment is not in never falling but in rising again after you fall.” Nothing describes Rangely High School’s 2018 football team better. Head coach Paul Fortunato speaks with pride and admiration for his football players perseverance. Fortunato directed Rangely (9-2) to just their third winning season since 2004 and their first playoff win since 2003 this past season. The Panthers had collected just six wins in the three previous years combined. When asked about the last season, Fortunato gives all the credit to his players who he says overcame so much adversity. His 10 senior football players: Tristan Moore, Drew Brannan, Riley Boydstun, AJ Lujan, Devin Ramirez, Stetson Cudo, Grady Nielson, Trenton Files, CJ Lucero, Lane Gillard and Phalon Osborn (manager), started as freshmen and sophomores because of a lack of upperclassmen playing football. His team played a tough schedule including playing three teams ranked in the top five in the state. Two years in a row they played the reigning state champions. When he recalls past seasons he says they were “murdered in the beginning” of the year. These same athletes were riddled with serious injuries including broken bones and torn ACLs. It would have been easier for his players to give up and throw in the towel but because of his leadership and motivation, which he will humbly denies, they kept coming back and dedicated themselves to improve day after day. Fortunato moved to Rangely in 1994 during seventh grade from Westminster. His dad, George, was a police officer and had the opportunity to become the director of CNCC’s Police Academy. Having a drive for sports, Paul was a standout in baseball, football and basketball for Rangely High School. He was recognized twice as all state, three times all conference in football, four times all conference and once all state in baseball. After high school Fortunato went on to play baseball for Colorado Northwestern Community College for two years and then spent a year playing at Friends University in Wichita, Kan. Athletics were an important part of his upbringing and education and he credits sports in giving him the motivation to do well in school. Now as a coach he likes to help motivate others to be the best they can be. Paul’s passion for coaching began while he was still in high school when he helped coach baseball for the recreation district. It continued on when he returned to Rangely from college in 2004. Summoned by Kurt Douglas, then head coach for the Rangely High School baseball team, Fortunato eagerly agreed to help and assisted Douglas for two years. When Douglas left, Fortunato became the head coach for the baseball team and remained the head coach for nine years. In 2007 and 2008 he was the assistant baseball coach for CNCC but soon realized his true passion was in high school sports. He transitioned to head coach for the high school football team and has been dedicating time to that program for the past seven years. Every great coach and mentor have one thing in common: they have had someone from whom they have taken coaching inspiration. For Fortunato this person was his head baseball coach in high school, coach Ron Hill. He adds that he was also positively influenced by his CNCC baseball coach Dustin Colborn and his dad George. Coaching has taught him to be more patient and understanding because you see people from all different walks of life. You learn public relations because you deal with kids, parents and the school administration. He has gained more appreciation for the coaches in his past and what the parents do for the players. He says coaching has also helped him learn to balance his busy life. When he isn’t coaching football he can be found working for TEP in the Piceance Basin, hunting and fishing, or spending time with his wife Jessica cheering on his three daughters at their sporting events. Never one to pass up an opportunity to make a difference in a young person’s life, for the past six years he has also coached his daughters’ competitive softball team, the Lady Dynamite softball team. Preparations for the Panthers’ 2019 season will began soon. In May, after baseball and track, Fortunato’s team will start practicing five days a week. In between school and practice the team will spend time in the weight room and work on cardio. Paul says that during the summer he tries to work around his players’ busy schedules. They are involved in more activities than just football and he encourages that. In June the team will attend football camp at the University of Northern Colorado. When asked what his hopes and goals are for the 2019 season, with a grin he replies, “Do it again!” The current team members had good leaders in their predecessors and the returning upperclassmen will be very successful if they follow in their footsteps. With a coach and mentor like Fortunato, the Rangely Panthers football team has already won.